Home»Uncategorized»How can childcare educators help children celebrate diversity during Christmas? Christmas is a magical time of year for kids. There’s fun parties, delicious food, magical lights… and of course, presents. 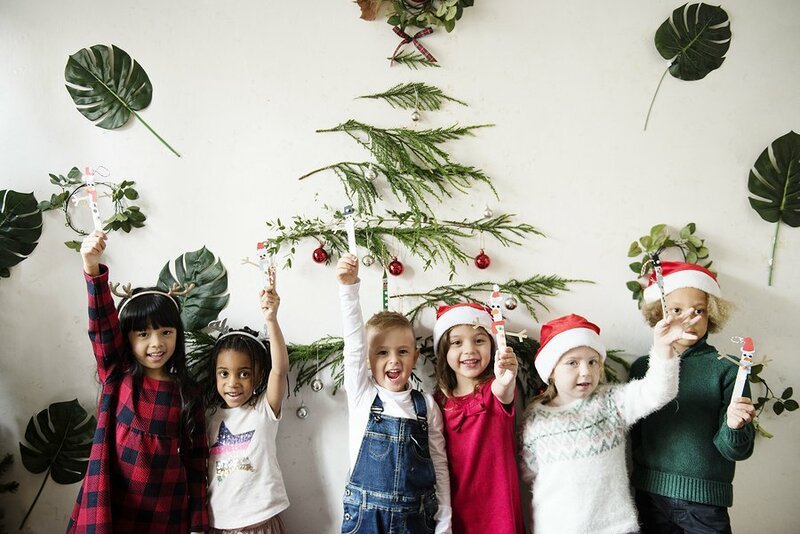 And with the silly season in full swing, it’s only natural childcare educators want to get in on the action too with a Christmas party at your centre. The only problem is that not all Christmases look the same. In fact, in a society as culturally diverse as ours there’s a good chance that a fair amount of the kids in your care don’t celebrate Christmas at all! This raises a prickly question for childcare operators and early childhood educators: just how do you have a fun Christmas celebration at your centre while also being inclusive to all beliefs? We’ve blogged before about the importance of building respect for different cultures and customs from a very early age. This is true at any time of the year. But it’s especially important around Christmas. Because while you know that not all cultures celebrate Christmas the same way (or at all), your kids might not. Teaching your class about other cultures isn’t just about broadening their horizons and educating them about the world – it’s also an important first step towards developing respect for other cultures in adulthood. And with over 300 different languages spoken in our homes, the importance of respecting the cultures, beliefs and celebrations of others cannot be understated. Building that respect starts early with exposing children to different cultures and customs while they’re young and quashing any discrimination that does arise during this time. What can you do to teach respect and acceptance? Young kids are like sponges. They mimic adults’ words, actions and even body language while absorbing information from their surroundings. And while they might not show it, young children who witness discrimination are able to pick up on discriminatory behaviour. There’s good news, however: they also pick up on acceptance and respect! You can use Christmas as an opportunity to teach children about other cultural backgrounds. Maybe you could read a book that talks about cultural events and holidays in different cultures for storytime. Alternatively, you could sit your children around in a circle and have each of them talk about the different ways that they celebrate Christmas or any other holiday. It’s a bit like a show-and-tell, but for each child’s unique Christmas experience. You could even throw an around-the-world themed party, with food and activities from around the globe alongside the traditional Christmas celebrations. We’re certain that’ll get a warm reception! Early childhood is when children first become aware of the differences between people. At this stage, children begin to understand the distinctions between family and strangers, genders, race and culture. Children aren’t blind to the differences between themselves, their peers and the majority. From ages as young as four, children are able to distinguish between themselves and others who are similar – or different – to them. And as a childcare educator, it’s up to you to teach the children in your care that these differences are to be celebrated! This is a great way of combating any sense of exclusion in children from different backgrounds. By celebrating their differences, you’re effectively telling them that their differences are a-okay and nothing to be ashamed of. Early childhood is a crucial period in a child’s development, and a supportive, inclusive environment is a must – but you didn’t need us to tell you that! While acknowledging and accepting the cultural differences around Christmas mightn’t have an obvious immediate effect, every little bit counts. So we’ve covered what you have to do to create an inclusive environment come Christmas. Now, we’ll briefly go over some of the don’ts when including other cultures in your Christmas celebrations. No kid likes being singled out and made to stand in front of the rest of the cohort. Not only is it embarrassing for them, but when done improperly it can just reinforce their “difference” from everyone else. Keep it positive and inclusive at all times. Children often say the darndest things, much to the surprise and frustration of the adults around them. For much of their childhood, kids’ understanding of social norms and politeness are very much a work-in-progress job. So if you hear any exclusive or potentially mean-spirited language coming from one of your children, don’t let it slide. Children learn through watching you after all. So set a good example… show them that those types of comments are a no-go! Childcare educators are key influencers during a child’s formative years! Enrol in our childcare courses in Sydney, Brisbane, and Melbourne to play your role in educating and nurturing the next generation! A child’s formative years are without a doubt the most important stage of their development, with even the littlest things leaving a mark well into adulthood. Setting children up for success in adulthood starts with early childhood. And that means creating an inclusive environment in childcare, where everyone – regardless of faith or colour – feels safe and included. Not only does it create a welcoming environment for children from different cultural backgrounds, but it also builds understanding and tolerant adults! If you want to be a part of building an accepting Australia, Southern Solutions offers a range of childcare courses in Sydney, Brisbane, and Melbourne that not only educate you, but nurture your passion for shaping young lives. Whether you’re a fresh school-leaver or looking at a late career change, we invite you to chat to one of our career consultants today! Call now 1300 656 321 or drop us a message and we will be in touch.